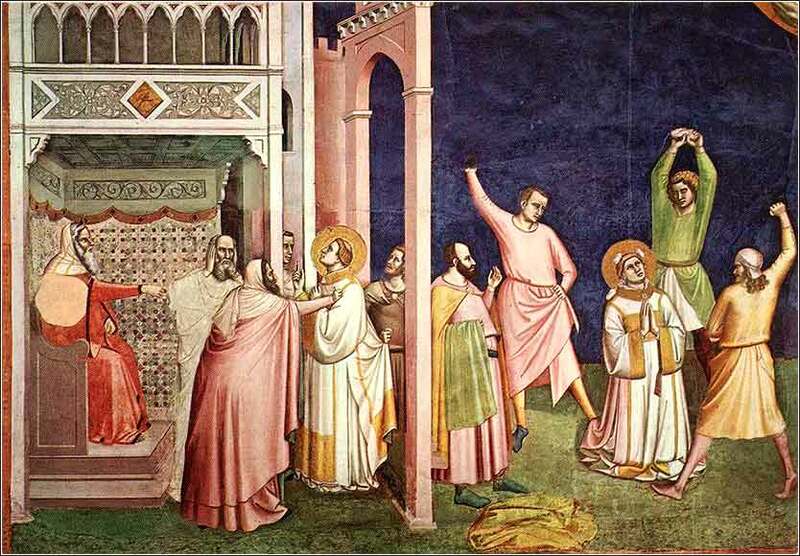 The Stoning of Stephen by Bernardo Daddi, ca. 1348. Stephen was the first martyr for Christ, put to death by the Sanhedrin in Jerusalem. At the Vatican Museum. Lord God, may all of your creation - from the vastness of mighty planets and stars to the lowliness of the smallest living creature I can see - remind me to live in wonder and appreciation of all that is around me. An Orthodox icon of Silas (or Silvanus). He was not one of the twelve apostles, but was important in the early church, and accompanied Paul on his first and second journeys. He is shown with chains, to commemorate his escape from prison in Philippi. And they will hate one another and provoke one another to fight. And the despised will rule over the honorable, and the unworthy will raise themselves over the illustrious. And many will be delivered to the few, those who were nothing will rule over the strong, the poor will be greater in number than the rich, and the impious will exalt themselves over the brave. The wise will be silent, and the foolish will speak. Brother will deliver brother over to death, and the father his child, and children will rise against parents and have them put to death, and you will be hated by all for my name's sake. As we read along in Matthew, we notice that some passages appear out of place, because they do not make sense chronologically. One notable example is that he gives a long account of the Sermon on the Mount; and yet, he was not present, for he relates his own calling as an apostle afterward. Today's passage gives another type of apparent inconsistency in timing. In verse 5, remember, Jesus told his apostles “Go nowhere among the Gentiles and enter no town of the Samaritans.” Yet here, suddenly, we find him speaking of things that will not occur (for the most part) until after his Ascension, including bearing witness to the Gentiles. Besides the inconsistency about preaching to Gentiles, there is a greater anachronismAnachronism: Something that appears to be out of place in time, occurring in a time period where it does not belong.. The missions in Judea that the apostles are about to embark upon will not occasion any great floggings or civil disruption, or people turning family members over to the authorities to be executed. Christ's words appear to change their time frame in the middle of his speech; but it could just as well be Matthew's doing. He seems to have changed gears, from chronological history to a thematic collection of teachings about missionary work. The other Gospels are more strictly chronological. One characteristic of Matthew is that he was a great collector of Jesus' teachings. Rather than attempting to present them piecemeal, when he reaches a point in the narrative where a theme arises, he will treat the theme with sayings that appear to be taken from other times and places. Matthew is more interested in treating specific themes comprehensively than in getting the timing right. His Gospel is a history, like all of the Gospels; but of the four, Matthew's is the most apt to group teachings by theme. Matthew 10 is such an essay or collection of teachings: “advice to disciples” or “converting people to Christianity”. One cannot say with certainty whether Christ, when he gathered the apostles to prepare them for their first mission without him, taught them the entirety of what Matthew relates in Chapter 10. He might have done; or Matthew might have added appropriate teachings that he heard at other times, or that he heard second-hand. But one can say with certainty that the advice is, at points, more appropriate to later disciples and missionaries than to the twelve apostles at this time. Christ foresees a great and sometimes violent division between those who believe in him and those who oppose him, a division that will not occur until after his death and, primarily, after his Ascension. He is speaking to his apostles; but he is also speaking to history, because many of the problems he addresses will not occur while he is alive. To our knowledge, Christ was the first to die in his own name; so certainly, such predictions as “[b]rother will deliver brother over to death” apply, not to the mission the apostles are about to undertake, but to future disciples, who will come later.